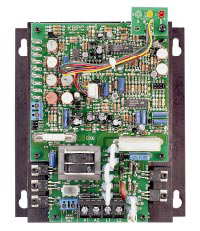 The KBCC-240D Series, manufactured by KB Electronics, has the same electrical features as the KBPC enclosed control, such as current rating and feedback type, jumper selectable voltage adjust, adjustable jog, speed/torque mode and three wire start stop. KBCC-240D drives are chassis SCR speed controls and have a variety of trimpots to allow adjustments for MIN and MAX speed, Current Limit, IR Comp, Acceleration, Deceleration, and Timed Current Limit. There is also flexibility with customer installed options, including On/Off AC Line Switch, Input Signal Isolation, Run-Stop-Jog, Electronic Potentiometer, Anti-Plug Reversing Module and Forward-Brake-Reverse.